Due to an overbooking, the team must decide who gets to fly the spare plane. In May of this year eight hardy soles ventured across the US and into the Bahamas in search of the ghost of the flats. The ghost is difficult to see, and some report even more difficult to catch. This year we broke with traditions of the past and stayed at "Glatos Bonefish Lodge" and arranged most of the trip ourselves. The flight across the US was an individual preference and concluded at a hotel in Ft. Lauderdale, the Wynward. 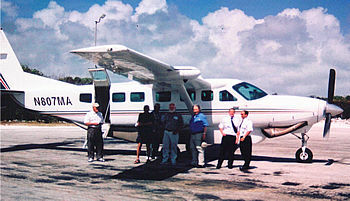 Shortly after arriving at our charter air carrier, Bimini Island Air, we learned that they had overbooked the flight, and our scheduled departure was delayed approximately three hours. That wasn't too bad; however, we had the lodge waiting for us in the Bahamas and needed to inform them of our delay. 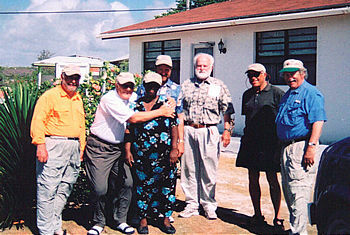 The staff at Bimini was very attentive and arranged for a later arrival with the lodge. The Charter Company even sprung for lunch. The flight over was great and the visibility over the island allowed unobstructed views of the vegetation, ocean, and miles of fishable flats. Once we checked through customs, the lodge owner, Tommy, was right there and coordinated the transfer to the lodge. Shortly we selected our rooms and settled in. Over the next six days the routine was much the same: wake in the morning, eat breakfast, shuttle to boats, and motor to various flats. The first day the tide was so low that the boats had to navigate a narrow channel of skinny water to reach the open ocean to travel south to the fishing area. This same water that in the past had been such a bone jarring trip seemed somewhat tame compared to previous trips. After a short run, we reached the fishing grounds and began hunting for bonefish. The wind was blowing and the water had a definite chop to it, making visibility difficult. There were no large schools of bonefish that we had become accustomed to in the past. Rather small schools or single fish were all we found. Single fish or a group of two or three fish usually indicates that they are larger fish and our experience this year was no exception. The fish we saw were typically larger fish. And they were harder to catch, especially in the heavy wind. Over the course of the remaining days the tide continued to rise earlier and earlier. We fished the creeks, the bites, the mangroves and even took time to cast for barracuda. The fishing was not great due to wind and chop, but we managed to catch fish every day. The team says farewell to their hosts. On the seventh day it was time to leave. We had breakfast, said good bye to Tommy and Veronica (our hosts) and made our way down the island to the airport where our charter flight was waiting. Dave Mann, Phil Drees, Roger Finke, Ed Welch, Wayne Taylor and I look forward to the next return trip and better catching. We had a good time and had the chance to experience some new guides and some of the past as well. Ed felt the he had two of the best guides he had ever had on the trip to the Bahamas.